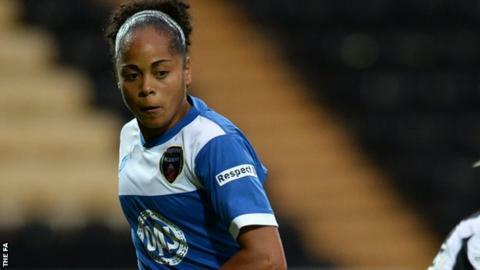 Jade Boho Say can inspire Bristol Academy to Women's Super League One safety, says manager Willie Kirk. The Equatorial Guinea forward scored the winner against Notts County on Wednesday, a day after making a 4,000-mile trip back from international duty. Victory was Bristol's first in the league this season and moves them to within a point of safety. "She is inspirational. Other players will see her as that focal point that they can get energy from," said Kirk. Jade, who has scored in all four Vixens games she has played since arriving in England from Rayo Vallecano last month, also hit the crossbar against Notts with an audacious effort from 40 yards after the break. "And there is the small fact that she probably ran a mini-marathon in that 90 minutes as well," added Kirk. "The ground she covers, the work-rate she gave is just unbelievable." When Jade Boho Sayo last flew back from international commitments, following their first Olympic qualifying tie against Nigeria last month, she came off the bench to score twice against Aston Villa as Bristol claimed their first win of 2015. Bristol captain Sophie Ingle said Jade has given the side renewed confidence with her daring approach to the game. "If you have someone like that on the team then you want to be like that," said Ingle. "She is ambitious and that is what we can get from her. We see her doing it, so we think 'why can't we do it?' It builds everyone and the team." The result lifts Bristol to within one point of second-from-bottom Birmingham City, who are the only other top-flight side with one league win to date this season. While Blues and Liverpool - sixth in the table and another three points ahead of the Vixens - have a game in hand, Kirk hopes they will begin to feel anxious. "Hopeful there is lots of pressure," he said. "What we said in the team meeting was 'they are fortunate because they had five cup finals and it was in their hands'. We now have four cup finals left. "It doesn't matter what Birmingham do or what Liverpool do, we just have to look after what is happening in Bristol strips."